Heel pain is nothing to balk at. In fact, those who are on their feet all day likely know the true agony of heel pain. Walking around while in pain can take away from your quality of life, and, if your profession involves being on your feet for 8 hours or more a day, it can put your career in jeopardy as well. Heel pain can be caused by injury, stress, medical conditions, or even poor footwear. Thankfully, there is something you can do to mitigate heel pain and make your feet happy again—getting a quality pair of shoes. The best shoes for heel pain can alleviate pain and give you a second lease on life. When are you looking for the best shoes for heel pain, you want a pair that has great arch support and ample cushioning. Shoes with removable foot beds also allow you to inset custom orthotics, which can add comfort and reduce heel pain and foot fatigue. Other things to consider are breathability, stability, comfort, and price. Now that you have a better idea of what to look for in shoes for heel pain, you might be wondering what the best shoes for heel pain are. Truthfully, the search process can be quite frustrating because there are many brands and models of shoes to consider. Thankfully, we’ve done all the hard work for you. After carefully perusing shoes for heel pain, we’ve chosen the best of the best. Keep reading for a breakdown of the top 10 best shoes for heel pain. Just because you have heel pain doesn’t mean that you shouldn’t be able to wear flip flops! You might think flip flops are off the table for you, when in fact, there are plenty of great options. The OOFOS Unisex Ooriginal Thong Flip Flop is one such flip flop. These are a quality pair of flip flips that have the support and comfort you need to alleviate heel pain while you’ll strolling around town. Designed to sooth your feet, the shock absorption in these shoes helps alleviate stress on your feet, joints and lower back. Plus, the OOFOS Unisex Ooriginal Thong Flip Flop is also made from odor and moisture resistant materials so you won’t need to worry about them becoming sweaty and smelling. They also have contouring toe posts so you won’t need to worry about the standard chaffing that often comes with flip flops. In addition, the OOfoam foot bed cushioning cradles and supports your arch while also encouraging natural foot movement. 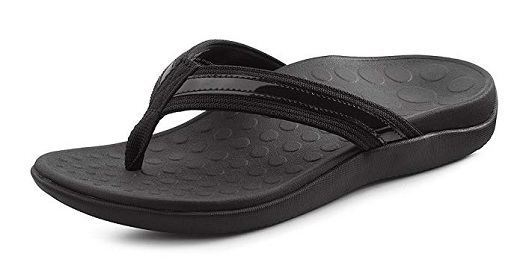 With a traction patterned outsole to keep you stable on your feet and a lightweight feel, the OOFOS Unisex Ooriginal Thong Flip Flop is a quality, decently priced pair of flip flops for someone with heel pain. If you are looking for a durable pair of flip flops that can stand up in water, check out the OOFOS Unisex Ooriginal Thong Flip Flop. From the quality Vionic brand, comes the quality Orthaheel Vionic Tide flip flop. Not only do these flip flops have something that most others do not—amply comfort and support—they are also packed with technology and other great features. You will love the EVA midsole that provides your feet the cushioning they need, in addition to the ample amounts of shock absorption that will reduce foot fatigue. Plus, the Orthaheel Vionic Tide have Orthaheel technology built right in. As the name suggests, Orthaheel technology gives both support and cushioning where you need it more—in the heel! The Orthaheel Vionic Tide is AMPA approved and even podiatrists agree that they’re a quality pair of flip flops when it comes to maintaining healthy feet. With webbed toe post, and rubber outsole to keep you from slipping, what else could you ask for in a pair of sandals for heel pain? Well, a geometric tread pattern that moves with your feet and the soft leather strap is one thing! What’s even better about the Orthaheel Vionic Tide is that they are middle of the road when it comes to price, and they provide everything you need for happy, healthy feet. If you need a great pair of sandals for heel pain, don’t overlook the Orthaheel Vionic Tide. Sometimes you want to slip on a pair of flip flops before heading out the door, but heel pain often keeps you from doing that because most options are not supporting. The OluKai Ohana finally changes that! Though not entirely as supportive as a pair of sturdy running shoes, the OluKai Ohana are flip flops that come in a variety of colors to suit your needs. In addition to being stylish, they are also great for those with heel pain! This sandal is chock full of cushion and support to alleviate heel pain. The plush rubber sole of the OluKai Ohana will absorb some impact to minimize the impact and stress that your feet feel. There is also soft nylon on the inner toe webbing, which means you won’t need to worry about blisters if you take them out for a stroll. One of the best features of the OluKai Ohana is that they are also made from water resistant synthetic leather and lined with a quick-drying material so you won’t need to be worried about becoming water logged. If you are looking for a high quality pair of flip flops that won’t break the budget, the OluKai Ohana should certainly be on your list of top sandals for heel pain to consider. If you are looking for a shoe that reduces heel pain, the New Balance 990v4 is a great one to consider. That’s because these shoes are the 4th generation of the 990 running shoe from New Balance and they’ve gotten better every edition. Not only does the New Balance 990v4 come with an extremely comfortable ENCAP heel and an EVA core, but the breathable mesh upper allows for enhanced temperature control inside the shoe to keep your feet dry and comfortable. In addition, these shoes are also lightweight and pretty stylish. The New Balance 990v4 also comes with an ENCAP PU ring, which is polyurethane fitted with an EVA core that offers all the cushioning and support your heel needs. Whether you are walking or standing all day, these are the best shoes for heel pain. The New Balance 990v4 also comes with a padded foam collar that prevents rubbing on your ankle and reduces irritation. 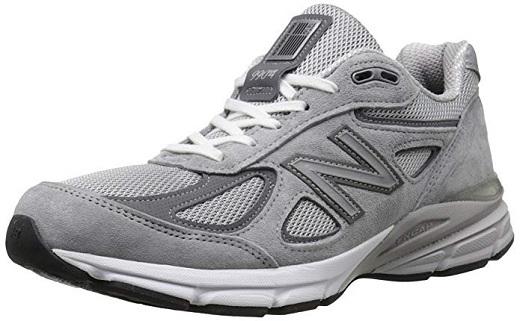 Though these shoes are a bit more expensive than other models on the market, the New Balance 990v4 have Medicare reimbursement to help with that! If you want a solid pair of shoes to alleviate heel pain, check out what the New Balance 990v4 has to offer. Want a pair of shoes that you can slip on and head out for a walk without worrying about heel pain? Then you need the Sketchers Go Walk 4. These sleek black shoes are not only stylish with a cool design, but they also have everything you need to reduce heel pain. The GoGa Max insole is made of responsive cushioning that forms to your foot to provide ample support and comfort. The Go-KNIT mesh upper is also a great feature that provides breathability so you can regulate the temperature inside your shoes and keep your feet dry. 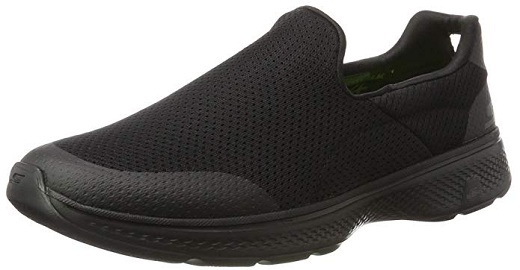 In addition to everything listed about, the Sketchers Go Walk 4 also sold also provides bounce back and cushioning to keep you light on your feet while you are working or out for a stroll. The Sketchers Go Walk 4 are also lightweight so you won’t feel the fatigue that comes with heavier shoes. Plus, the rubber outsole gives you all the traction you need to avoid slipping. What’s even better about the Sketchers Go Walk 4 is that they are very affordable. Priced in the low to mid-range price, you can grab a pair without busting your budget. If you need a pair of shoes for heel pain, definitely consider the Sketchers Go Walk 4 during your search! Running shoes that are great for heel pain can be hard to come by, but the ASICS Men’s GEL Cumulus 17 Running Shoe solves that conundrum. In fact, these stylish shoes that come in a variety of colors, are perfect shoes for road and trail runners or even just someone walking around town. The ASICS Men’s GEL Cumulus 17 Running Shoe comes with a FluidRide midsole that is specifically designed to cushion and support your foot as you run. Plus, it also offers bounce back to give you more spring in your step while absorbing impacts so you feel reduced stress on your joints and feet. 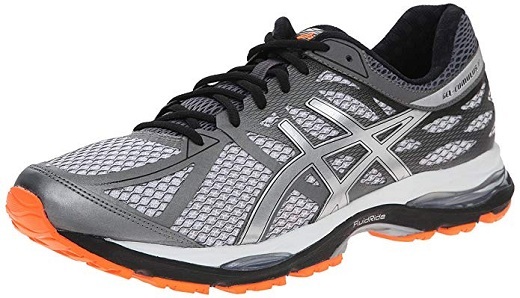 In addition to everything listed above, the ASICS Men’s GEL Cumulus 17 Running Shoe also has a Guidance Line Trusstic System that keeps your gait natural and provides good support to your midfoot. The ComforDry sock liners also provide cushion around your ankles but have anti-odor properties so you don’t need to worry about your shoes becoming too pungent. With discreet eyelets, GEL inserts, and great arch support and heel cushioning, the ASICS Men’s GEL Cumulus 17 Running Shoe have everything you need. For a great pair of running shoes for heel pain, you should certainly consider these shoes during your search process. For a solid pair of clogs that help with heel pain, the OOFOS Unisex OOcloog Clog is definitely something to consider. These clogs come in widths from narrow to wide, meaning you can always find a pair that fits you securely. In addition to that, these clogs have everything you need to keep your feet happy and healthy. From ample arch support—people with plantar fasciitis love this!—to a biomechanically designed foot bed, the OOFOS Unisex OOcloog Clog is packed with great features. The vented sides are also in place to keep your feet dry and the rubber sole has a non-slip pattern that gives you stability no matter what the terrain or weather conditions. With a nubuck upper, these slip on clogs is great for alleviating heel pain and providing all of the comfort and support you need. With technology in the foot bed that supports the natural movement of your feet, the OOFOS Unisex OOcloog Clog is great for people on the move. Plus, they’re affordable so you can pick up a pair without busting your budget. If you need a good pair of slip on clogs for heel pain, check out what the OOFOS Unisex OOcloog Clog is all about. Sometimes you aren’t looking for a walking or running shoe that alleviates heel pain. Sometimes you want a good pair of casual shoes that allow you to reduce pain in the heels and the OLUKAI Men’s Moloa does just that. Not only do these stylish slip on brown shoes have a nubuck leather upper, but they also have a rubber cushioned sole that conforms to your foot. With a contoured foot bed and microfiber suede cover, the OLUKAI Men’s Moloa foot bed is both washable and moisture wicking to keep you padded and cozy all day or night long. With a rubber outsole on the OLUKAI Men’s Moloa, you won’t need to worry about slipping and falling. The wide ankle opening also allows you to get in and out of the shoe easily, which is great for someone that is always on the go! These shoes are literally perfect for walking around town or casual gatherings, and with a plush foot bed, you won’t need to worry about heel pain anymore! These shoes are a bit more expensive, comparable to a solid pair of running shoes, but they’re built to last and give you the cushioning you need. For one of the best shoes for heel pain, check out the OLUKAI Men’s Moloa. There have been a lot of sandals and clogs on this list, but if you are looking for a quality air of shoes for heel pain, the Brooks Adrenaline is certainly a good shoe to consider. These stylish running shoes come in a variety of colors and are extremely lightweight at just 9 ounces. Plus, the 12 mm midsole drop is perfect for offering the cushion and support you need. What’s great about the Brooks Adrenaline is that they are the perfect shoe for road running, but they are also stylish enough to wear as you zip around town running errands. If technology and advanced features are what you’re after, the Brooks Adrenaline certainly delivers! These shoes come with a DNA midsole that forms to your feet and offers all the cushioning and support you need. Plus, the Brooks Adrenaline also comes with a streamlined mesh upper that allows breathability so your feet can easily regulate temperature and stay dry while you’re working out. 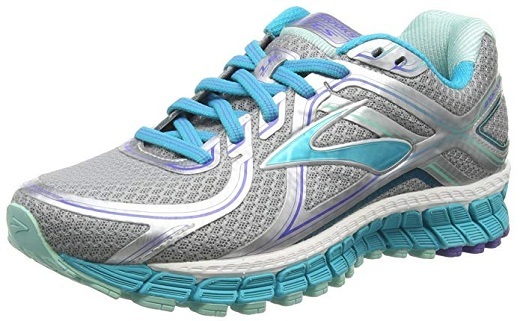 The Brooks Adrenaline also offers softer cushioning than previous versions and has enhanced flexibility for easier heel to toe transitions that alleviate heel pain. If you are looking for a fairly priced pair of best shoes for heel pain, take a look at what the Brooks Adrenaline is offering. Last but not least, the Dansko Women’s Sophie Sandal is another option to consider if you are looking for a quality pair of sandals that are great for alleviating heel pain. The stylish sandals come from a quality name in Dansko and are comfortable, supportive, and durable. Plus, these shoes are even approved by the American Podiatric Medical Association, which means that they are good for helping maintain healthy feet. These platform sandals have a padded suede foot bed that provides cushioning. The synthetic sole is also equipped to provide great traction in any elements. 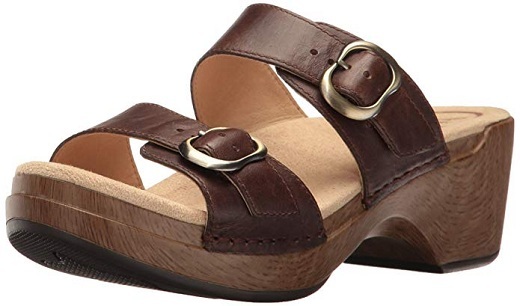 In addition to being stylish, the Dansko Women’s Sophie Sandal is also comfortable. These shoes have shock absorbing cushioning that reduces fatigue and stress on your feet, which in turn, alleviates heel pain. These are a great pair of sandals for someone who is on their feet all day or those who plan on walking all around town. With two buckle straps, you can also ensure that your foot is secure and won’t slip around. Though theses shoes are a bit heavier, they are reasonably priced for what you are getting and make for a great summertime shoe! For a solid pair of sandals great for heel pain, the Dansko Women’s Sophie Sandal should be on your list to consider. Whether you are looking for a pair of great flip fops that provide heel support or running shoes that will help you get through your workout without irritating your heel, these are the top options on the market for you! From quality brands like ASICS, Brooks, Dansko, and OOFOS, whatever you are looking for, this list has it!